This Cozy, Special Cabin is off grid and very comfortable. It functions with gas lights and gas stove. Water is supplied by a spring to the cabin by gravity feed. There is an outdoor shower heated by gas - really fun and comfortable. Clean and private toilet is just a few steps away in our very clean outhouse. Appalachian trail is within 1/2 mile by way of East B Hill Rd.. ATV trails are close. Firewood, linens, and full kitchen amenities are supplied. 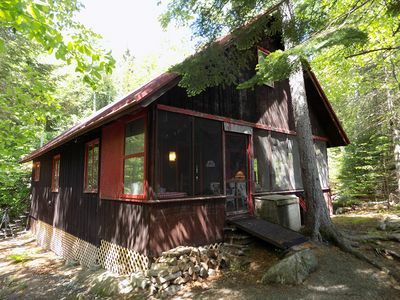 This cabin offers very close proximity to Appalachian Trail , waterfalls. 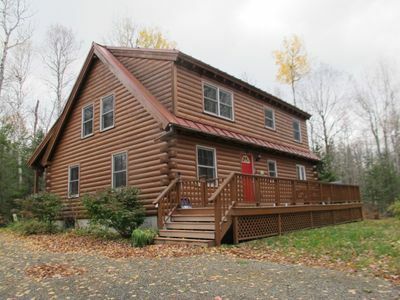 Cabin is approximately 8 miles from Andover town center. Hiking, biking, horse back riding, ATV'ing are at your fingertips. Richardson Lake and Umbagog are close. Grafton Notch is just across the way. Discharge of firearms and fireworks is not permitted on the property. No smoking in the building. There is no wifi or cell service. Although we do allow pets we require guests to clean up after their pets. Pets are not allowed on beds and furniture. 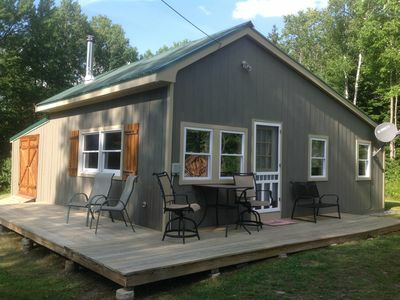 Cozy, off grid, clean, screened porch,easy access, open & wooded cabin. 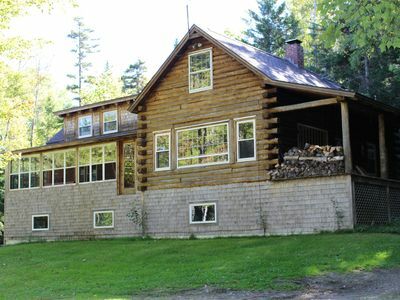 Cabin has gas and electric lights, gas cook stove & a wood stove for heat. Running water for kitchen, bathroom & shower is supplied by gas water heater and generator. 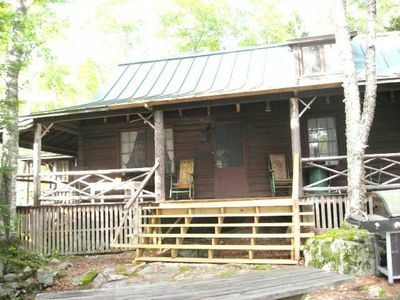 The cabin is 1 mile from the Appalachian Trail on East B Hill road. ATV trails are close. The closest ATV trail connectors are 6 miles to Andover or Upton. Waterfalls, such as Dunn falls & the Cataracts, are within 1.5 miles. 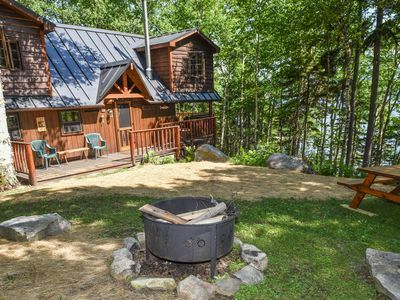 This is a great cabin to enjoy all the area has to offer. ATV riders, hikers, fisherman, site seeing in a beautiful area of the Appalachian mountains. Dark skies and easy access privacy! 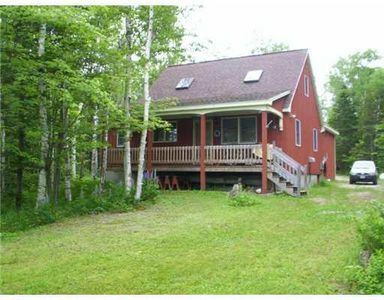 Super-clean, open yard, mountain stream, swings for kids, fire pit for fires, and a big kitchen to cook in. There is no wifi or cell service. No smoking in the building. No discharge of firearms or fireworks on the property. Although we do allow pets we require guests to clean up after their pets. Pets are not allowed on beds and furniture. Welcome to Upton Road Farmhouse, a renovated old farmhouse located on in the heart of nature's playground. 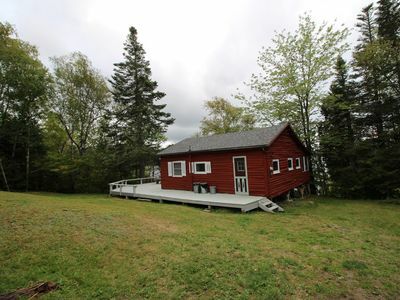 Snowmobile, ATV, hiking and horse trails are within minutes of the house. Skiing at Black Mountain, Sunday River, and Mt. Abram is within a short drive. Fishing, hunting, biking, boating, swimming and more are available within our town. Our cozy rural town will provide you with a quiet "get away from it all" atmosphere. This guesthouse suits all of your basic needs for a comfortable stay. 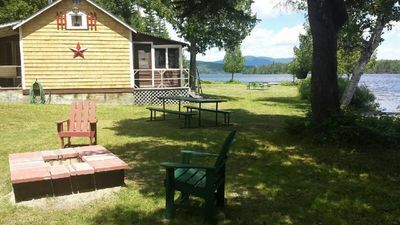 Beautiful, private spot right on Mooselookmeguntic Lake. Main level has a fully equipped kitchen, dining room, living room with a massive stone fireplace and a bedroom with a full bed, upstairs is the master bedroom with a full bed and a bathroom with a Jacuzzi tub. The third bedroom is in the basement, it has 2 twins. 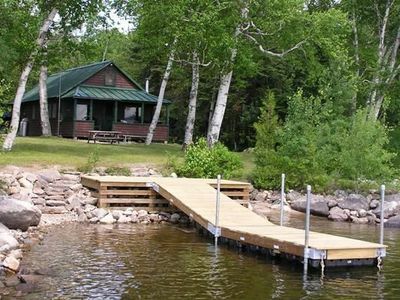 There is a large open deck with table, chairs, a gas grill & great views of the lake about 200 feet down a graveled path. At the private waterfront there is a dock and a dry dock. There is a sandy, gradual entry into the water. There is also a fire pit in the front of the house. COMPLETE AMENITY LIST: 24 Hour On Call Maintenance, Cabinets, Cable TV, Carbon Monoxide Detector, Chairs, Coffeemaker, Cooking Utensils, Cooking Ware, DVD Player, Deck, Dining Room, Dishware, Dishwasher, Dock/Boat Slip, Dryer, Family/kids friendly, Fire Pit, Hammock, Heating, Indoor Fireplace, Jetted Bath, Kettle, Kitchen, Lake Views, Laundry Soap, Linens Provided, Microwave, Mountain View, Outdoor Dining, Outdoor Grill, Oven, Paper Towels Provided, Parking, Refrigerator, Safety Card, Satellite TV, Sink, Smoke Detectors, TV, Table, Table Utensils, Toaster, Toilet, Walkway To Water, Washing Machine LOCAL ACTIVITIES: Camping, Children's Activities, Cinemas, Cycling, Fresh Water Fishing, Golfing, Hiking, Horseback Riding, Hunting, Mountain Biking, Mountaineering, Sailing, Shopping, Sightseeing, Swimming, Wakeboarding, Water Tubing, Waterskiing WHAT'S NEARBY: ATM, Autumn Foliage, Bank, Bars, Beauty Salons, Bowling, Church, City Park, Farmers Market, Florist, Forests, Gift Shop, Grocery Store, Lake, Laundromat, Library, Live Entertainment, Marina, Massage Therapist, Museums, Picnic Tables, Play Ground, Private Beach, Public Beach, Restaurants, River, Scenic Drives, Thrift Stores, Waterfalls Please note that a tax of 9% may not be charged by the booking site and will be collected upon arrival. 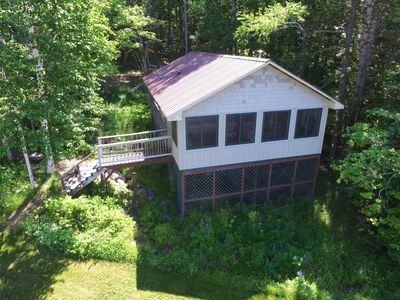 Beautiful new home on Mooselookmeguntic Lake - with sandy beach, open deck, screened porch, flat lawn, dock, and gorgeous views! A three bedroom one bath cottage with newly updated kitchen and living area. Large open deck in the front with picnic table and charcoal barbecue. Two bedrooms each offer a full size bed and the loft bedroom has two twin beds. A tv with a dvd player are available in the cottage. Enjoy two hundred feet of accessible waterfront with sandy beaches. 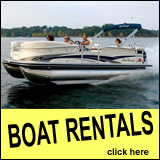 There is an available mooring for your personal boat (18ft. or under). A dinghy is available to access the mooring and a canoe is available for your enjoyment of the lake. Paddles and lifejackets are in the house. The crystal clear lake offers enjoyable water sports while the beaches and lawns are great for sunning and lounging. Surrounding the house you can find many wild blueberry bushes and enjoy picking your own blueberries while in-season (Typically end of July-August). The waterfront area offers a firepit, picnic table and lounge chairs. 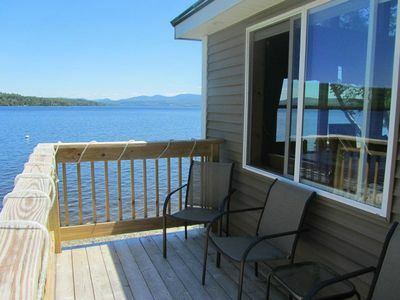 Large dock/deck area is also great for lounging and enjoying the views. You can rent a boat, pack a picnic and explore the uninhabited shores, hidden coves and remote islands. 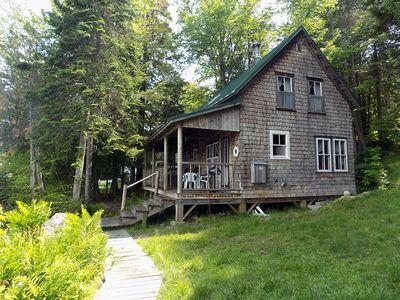 Please note the maximum legal occupancy of the cottage is six total adults and children. This small cottage is perfect for a couple or a small family looking to step back in time and relax. Welcome to 76 West, a renovated 100+ year old farmhouse located in the heart of nature's playground. 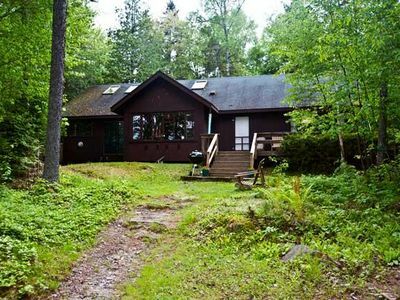 Snowmobile, ATV, hiking and horse trails are within minutes of the house. Skiing at Black Mountain, Sunday River, and Mt. Abram is within a short drive. Fishing, hunting, biking, boating, swimming and more are available within our town. Our cozy rural town will provide you with a quiet "get away from it all" atmosphere. This guesthouse suits all of your basic needs for a comfortable stay. The farmhouse is a duplex and both the West and East side are available for short term rentals. (Please ask about a discount if renting both sides.) The two sides are securely separated but if you would like to rent both sides, the upstairs hallway door can be unlocked in order to share the space. The hosts live within walking distance and is available to help meet your needs and make your stay a comfortable one. Children - The original construction of the farmhouse is over 100 years old. While much of the house has been updated and renovated over the years, it still retains the charm of some of its classic features. For this reason, this house may not be suitable for the safety of young children and toddlers. Please discuss any children staying in the house prior to making a reservation to ensure a pleasant and safe stay. Bathrooms - Both bathrooms (one upstairs, one downstairs) are recently renovated and include modern fixtures, including a toilet, sink and large shower (no bathtubs) as well as towels and assorted toiletries. The ground floor bath is located next to the washer and dryer. Kitchen - The kitchen includes newer appliances including a standard sized refrigerator/freezer, oven/stove, microwave, toaster, coffee maker, cookware, cutlery, dinnerware, etc. Bedrooms - All three bedrooms (a queen, full and twin) are located on the second floor and include the standard amenities (bedding, dresser, night stand, lamp, closet, etc.) As with some older homes, the light switches are near the door on the outside of the rooms and there are limited outlets but extension cords are available. The bedroom doors are original and fully close and latch but do not lock. Living Room - The living and dining rooms are open to each other and are spacious enough to host a small gathering or event (no loud parties). The living room has a standard seating area and is equipped with with a Roku smart tv that is connected to the house WiFi. You may use the the tv by signing in with your own Netflix, Amazon Prime, Hulu, Sling and other accounts. You will also be able to access other limited free viewing through the tv. If you do not have an account, many of the streaming services offer a free trial that you could subscribe to during your stay. Dining Room - The dining area has a wooden table and six chairs and tablecloths, placemats and napkins are provided. Entertainment - WiFi is provided throughout the house. Our WiFi service is the best that is available for this area (sorry, no Fios here) and is adequate for streaming video as well as standard internet use and a Roku Smart TV is available in the living room. No cable or satellite is available at this time. Assorted games and books are also available in the house for your use. Local Amenities - Andover is a very small town but it does have some services including two general stores, a restaurant and bakery, hardware store, playgrounds, and more. Guset Access - Guests have full access to the west (front) side of the house, porch, and large yard. The spacious parking area must be shared with any guests renting the other side of the house. The attached barn/garage is not available for guest use. Host Availability - I live very close by, within walking distance. As you will be able to check in and have access to the house at your convenience, I may not be able to meet you upon arrival but I will check in with you shortly after you arrive to ensure you have what you need and answer any questions. I welcome calls or messages if you need any assistance during your stay. Notes on the Area - The Western Maine region is fairly rural and Andover is located about 30 minutes from the nearest grocery stores. There are not any 24-hour stores within a reasonable distance. Guests should be prepared to bring supplies that they will immediately need with them, especially when arriving at night as most stores in the area close at 8-9 pm. After leaving Andover, the nearest gas stations are about 20 miles away, guest should be aware so that they don't run out of gas before they get to their destination. Depending on your carrier, cell phone service especially data (3G/4G) can be spotty in this area. Most people can receive and make phone calls from the farmhouse without issue but while traveling through the area, you will encounter several dead zones. Many carriers do not cover this area of Maine with data coverage. I know that US Cellular and Verizon offer 4G and it is usually reliable in the region. For all others, please check with your cell phone provider. We do have WiFi at the farmhouse to help with your data needs and there are several establishments in the area that have free WiFi available. 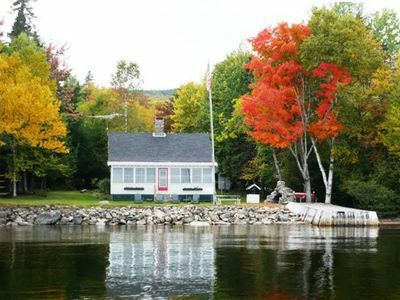 Andover Amenities - This is a very rural town, surrounded by the western Maine mountains. The views are breathtaking and the town atmosphere is like taking a small step back in time. The town offers numerous outdoor recreational opportunities in all seasons. Hunting, fishing, ice fishing, horseback riding, bicycling, hiking, boating, swimming, cross country skiing, snowshoeing, ATV and snowmobiling ... Other outdoor adventures are a short ride a away - three alpine ski resorts, cross country ski trails, mountain biking, canoing, kayaking, numerous hiking trails, and more. The town of Andover has many amenities. 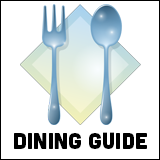 There are two general stores that have groceries, alcohol and other sundries as well as pizza ovens and a grill, serving meals all day. One store also has a gas station. The Little Red Hen Diner and Bakery is also open for breakfast and lunch, dinner is served on the weekend. There is a seasonal ice cream shop, cross country ski store, hardware store, bike shop, herb shop, and masseuse. Within walking distance you can enjoy a picnic on the Town Common, play tennis or basketball, and chase the kids on the two playgrounds. Our library offers a book swap section and their WiFi can be accessed even during off hours. A few of our local farms sell meat, dairy, eggs and produce directly off the farm. There are also several Registered Maine Guides in the Andover area that are available for guiding wildlife veiwing, boating excursions, fishing trips, hunting parties, etc. If you need recommendations or are looking for something specific, please ask and we will help find the service or product that you need. Getting Around - The rural area makes a car necessary for getting to the farmhouse and around the area. The house is about 2 hours from Portland, Maine, 3-3.5 hours from Boston, Montreal, and Bangor. The farmhouse is well located in the center of the town and is within walking distance of the stores and restaurant. 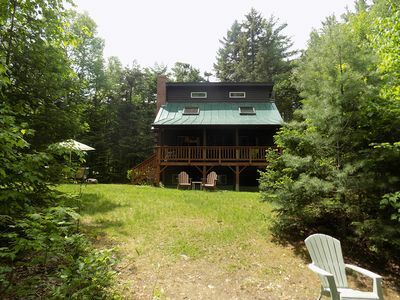 ATV, snowmobile and horse trails can be accessed directly from the house. The local cross country ski and snowshoe trails are within walking distance. Hiking, swimming, boating are within a short drive. 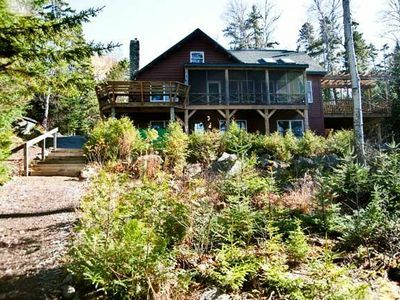 Large waterfront home on Mooselookmeguntic Lake! Welcome to 76 East, a renovated 100 year old farmhouse located in the heart of nature's playground. 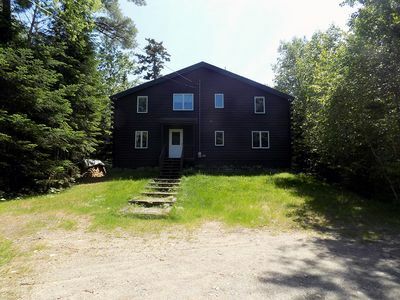 Snowmobile, ATV, hiking and horse trails are within minutes of the house. Skiing at Black Mountain, Sunday River, and Mt. Abram is within a short drive. Fishing, hunting, biking, boating, swimming and more are available within our town. Our cozy rural town will provide you with a quiet "get away from it all" atmosphere. This guesthouse suits all of your basic needs for a comfortable stay. The farmhouse is a duplex and both the West and East side are available for short term rentals. (Please ask about a discount if renting both sides.) The two sides are securely separated but if you would like to rent both sides, the upstairs hallway door can be unlocked in order to share the space. The hosts live within walking distance and is available to help meet your needs and make your stay a comfortable one. Children - The original construction of the farmhouse is over 100 years old. While much of the house has been updated and renovated over the years, it still retains the charm of some of its classic features. For this reason, this house may not be suitable for the safety of young children and toddlers. Please discuss any children staying in the house prior to making a reservation to ensure a pleasant and safe stay. Bathrooms - Both bathrooms (one upstairs, one downstairs) are recently renovated and include modern fixtures, including a toilet, sink and large shower (no bathtubs) as well as towels and assorted toiletries. The ground floor bath includes the washer and dryer. Kitchen - The kitchen includes newer appliances including a standard sized refrigerator/freezer, oven/stove, dishwasher, microwave, toaster, coffee maker, cookware, cutlery, dinnerware, etc. Bedrooms - The two bedrooms (one with one double bed, the other with two double beds) are located on the second floor and include the standard amenities (bedding, dresser, night stand, lamps, closet, etc.) As with some older homes, the overhead light is on a pull chain and there are limited outlets but extension cords are available. The bedroom doors are original and fully close but do not lock. Living Room - The living room is spacious enough to host a small gathering or event (no loud parties). It has a standard seating area and is equipped with with a Roku smart tv that is connected to the house WiFi. You may use the the tv by signing in with your own Netflix, Amazon Prime, Hulu, Sling and other accounts. You will also be able to access other limited free viewing through the tv. If you do not have an account, many of the streaming services offer a free trial that you could subscribe to during your stay. Dining Room - The dining area has a table and six chairs and tablecloths, placemats and napkins are provided. Entertainment - WiFi is provided throughout the house. Our WiFi service is the best that is available for this area (sorry, no Fios here) and is adequate for streaming video as well as standard internet use and a Roku Smart TV is available in the living room. No cable or satellite is available at this time. Assorted games and books are also available in the house for your use. 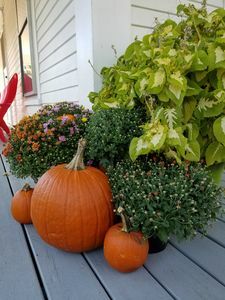 Local Amenities - Andover is a very small town but it does have some services including two general stores, a restaurant and bakery, hardware store, playgrounds, and more. Guest Access - Guests have full access to the east (back) side of the house, porch, and large yard. The spacious parking area must be shared with any guests renting the other side of the house. The attached barn/garage is not available for guest use. The hosts live very close by, within walking distance. As you will be able to check in and have access to the house at your convenience, we may not be able to meet you upon arrival but we will check in with you shortly after you arrive to ensure you have what you need and answer any questions. We welcome calls or messages if you need any assistance during your stay. The Town - This is a very rural town, surrounded by the western Maine mountains. The views are breathtaking and the town atmosphere is like taking a small step back in time. The town offers numerous outdoor recreational opportunities in all seasons. Hunting, fishing, ice fishing, horseback riding, bicycling, hiking, boating, swimming, cross country skiing, snowshoeing, ATV and snowmobiling ... Other outdoor adventures are a short ride a away - three alpine ski resorts, cross country ski trails, mountain biking, canoing, kayaking, numerous hiking trails, and more. The town of Andover has many amenities. There are two general stores that have groceries, alcohol and other sundries as well as pizza ovens and a grill, serving meals all day. One store also has a gas station. The Little Red Hen Diner and Bakery is also open for breakfast and lunch, dinner is served on the weekend. There is a seasonal ice cream shop, cross country ski store, hardware store, bike shop, herb shop, and masseuse. Within walking distance you can enjoy a picnic on the Town Common, play tennis or basketball, and chase the kids on the two playgrounds. Our library offers a book swap section and their WiFi can be accessed even during off hours. A few of our local farms sell meat, dairy, eggs and produce directly off the farm. 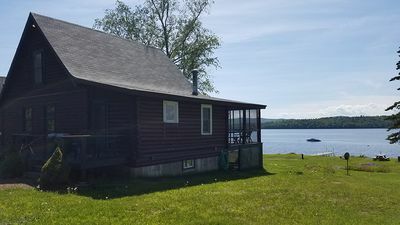 There are also several Registered Maine Guides in the Andover area that are available for guiding wildlife veiwing, boating excursions, fishing trips, hunting parties, etc. If you need recommendations or are looking for something specific, please ask and we will help find the service or product that you need. Getting Around - The rural area makes a car necessary for getting to the farmhouse and around the area. The farmhouse is well located in the center of the town and is within walking distance of the stores and restaurant. 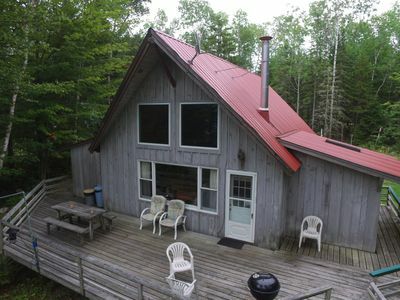 ATV, snowmobile and horse trails can be accessed directly from the house. The local cross country ski and snowshoe trails are within walking distance. Hiking, swimming, boating are within a short drive. House Rules We would like this to be your home away from home and strive to make it a comfortable stay for all of our guests. For this reason, we would like to make you aware of the following information. Security: The farmhouse is separated into two living spaces, West (front) and East (back), that are both available for rent. Both sides have a separate entrance and are secure from each other. If you rent both sides, there is one hallway door upstairs that can be unlocked so that all spaces may be shared. Otherwise, it is bolted and locked. Please respect the space of the other guests. Noise and Parties: Please be courteous of the neighbors and any guests staying on the other side of the farmhouse. No loud parties or events are allowed that would infringe on their comfort or their space. Shared Space: The other side of the farmhouse is separate (no shared living space) but kindly share the yard and driveway with other guests. The yard is about an acre and the driveway can easily fit 5-6 vehicles or trailers so there is ample room for everyone. Smoking: NO smoking of any kind is allowed in the house or on the porch. Children: This is an old house and although the farmhouse is renovated, many of its features, may not be suitable for the safety of young children. Please discuss all ages of children staying with us in advance of booking with children. Pets: At this time, we cannot accept pets in the house. Horses: Although we cannot provide shelter, there is ample room for horses in the yard. You must provide a portable fence. Cleaning: We charge a cleaning fee to cover a whole house flat surface cleaning, bathroom cleaning, as well as washing towels and linens once guests depart. While we are happy to wash any dishes left in the sink, we kindly ask you to clean up any major cooking messes prior to departure. Off Limits: For safety reasons, the attached barn, the attic, and the basement are not for guest use and we ask that no one enter these areas of the property. Snow and Ice: In the event of snow, we will provided plowing and shoveling but it may not be immediately available (usually done once a day, depending on the storm). You may need to shovel a path or sand/salt (provided) an icy patch for your convenience. 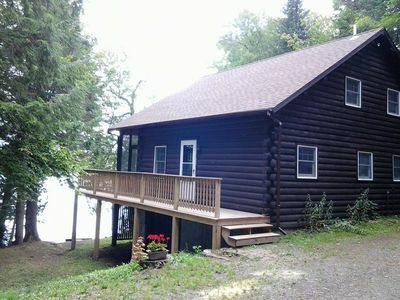 This original log cabin on the shores of Mooselookmeguntic Lake has 4 bedrooms and 2 baths. 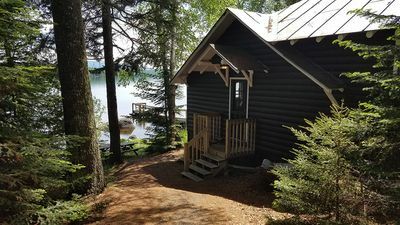 The cabin sits 500 feet away from the Lake and has amazing views. Inside there is a large open living/dining room just off the eat in kitchen. The main floor also has 2 bedrooms, one with a queen and the other with 2 twins, there are also 2 full baths, one with a shower and one with a tub and the washer/dryer. Up stairs are 2 more bedrooms, one with 2 twins and one with 3 twins. Great place for fishermen and families. (It is on a compound with about 20 other cabins) COMPLETE AMENITY LIST: 24 Hour On Call Maintenance, Bathtub, Cabinets, Chairs, Coffeemaker, Cooking Utensils, Cooking Ware, Desk, Dining Room, Dishware, Dock/Boat Slip, Dresser, Dryer, Family/kids friendly, Fire Extinguisher, Freezer, Gas Stove, Hangers, Heating, Kettle, Kitchen, Lake Views, Lamps, Laundry Soap, Linens Provided, Local Guides / Maps, Microwave, Mirror, Mountain View, Nightstand, Oven, Paper Towels Provided, Parking, Pets Allowed, Porch, Refrigerator, Safety Card, Shower, Sink, Smoke Detectors, Sofa, Spices, Table, Table Utensils, Toaster, Toilet, Washing Machine ON-SITE EQUIPMENT: Deck Chairs LOCAL ACTIVITIES: Boating, Camping, Children's Activities, Cinemas, Cycling, Fresh Water Fishing, Golfing, Hiking, Horseback Riding, Hunting, Mountain Biking, Sailing, Swimming, Tennis, Wakeboarding, Water Tubing, Waterskiing, Wind Surfing WHAT'S NEARBY: ATM, Autumn Foliage, Bank, Bars, Beauty Salons, Bowling, City Park, Farmers Market, Florist, Gift Shop, Grocery Store, Lake, Laundromat, Library, Live Entertainment, Marina, Massage Therapist, Museums, Picnic Tables, Play Ground, Public Beach, Restaurants, Waterfalls Please note that a tax of 9% may not be charged by the booking site and will be collected upon arrival. A two bedroom one bath cottage with kitchen and living area. One bedroom offers a full size bed and the second bedroom has two twin beds. A tv with a dvd player and wifi internet access are available in the cottage. Screened and glassed in porch allows for unobstructed views of the lake. The crystal clear lake offers enjoyable water sports while the shared beaches and lawns are great for sunning and lounging. You can rent a boat , canoe or sunfish, pack a picnic and explore the uninhabited shores, hidden coves and remote islands. 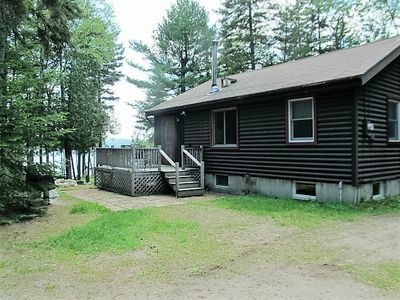 Please note the maximum legal occupancy of the cottage is four total adults and children. If additional space is needed please contact us. 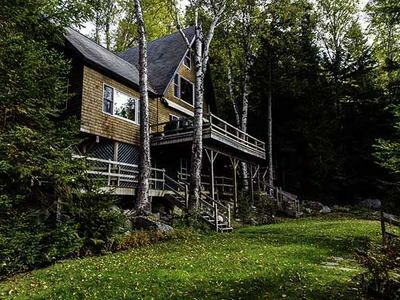 Lovely cottage nestled in the woods overlooking Mooselookmeguntic Lake. This cottage contains two bedrooms and one bathroom with kitchen and living area. One bedroom offers a full size bed and a single bed. The second bedroom has one full sized bed. The porch has a full sized pull-out couch, seating area, and a second dining table. A tv with a dvd player and wifi internet access are available in the cottage. The crystal clear lake offers enjoyable water sports while the shared beaches and lawns are great for sunning and lounging. You can rent a boat , canoe or sunfish, pack a picnic and explore the uninhabited shores, hidden coves and remote islands. 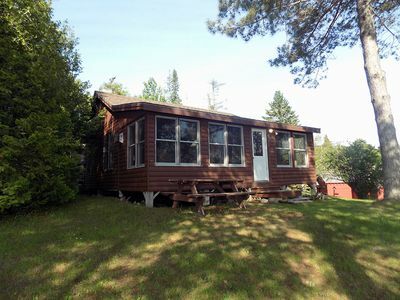 Please note the maximum legal occupancy of the cottage is five total adults and children. If additional space is needed please contact us. 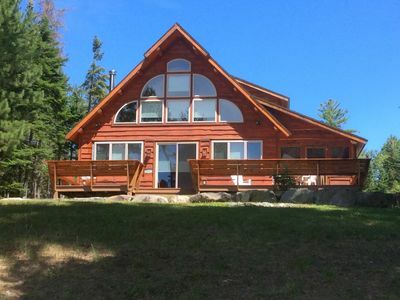 Nice log home nestled amongst large hard wood trees and in a very private location. 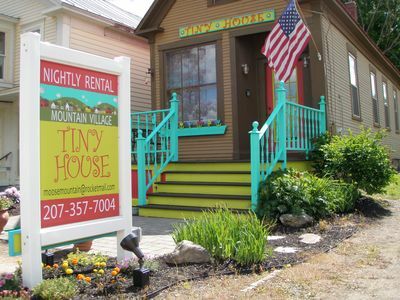 At the edge of civilization, the Tiny House is in a tiny town at the end of two state highways, surrounded by thousands of acres of recreational paradise. 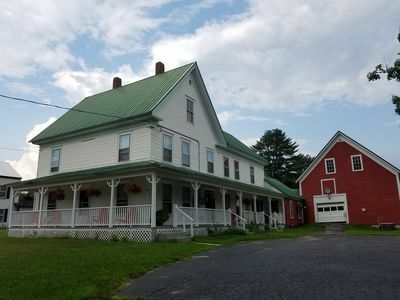 Andover is a quiet tiny town, located just a few miles from the Appalachian Trail, right in the heart of vacationland. Route 5 has been called "Moose Alley" due to the large number of moose sightings near the road. If you love what the woods have to offer…. hunting, fishing, ATVing, snowmobiling, kayaking, hiking, etc. but appreciate electricity and running water, this Tiny House is perfect! 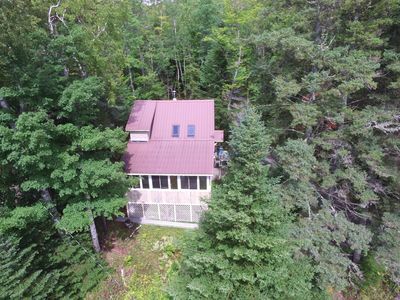 Hot showers, a full kitchen and convenience to village amenities (like food & gas) and direct access to ITS and ATV trails, right from the property. 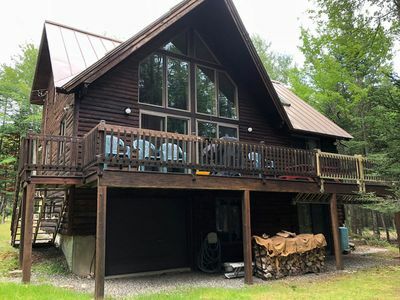 AND, this rental is truly the best of both worlds BECAUSE included with your rental is a private "playground" up on a ridge five miles north of town. You can even snowmobile or ATV to it. A camp fire pit, seasonal hammock, chairs AND the panoramic mountain VIEWS! The ridge is surrounded by thousands of acres of forest, trails and gravel roads for biking, hiking, snowmobiling and ATVing. 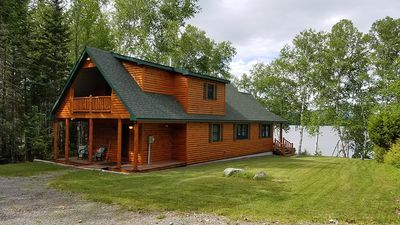 Located right in the village, you can hop on your ATV or snowmobile and ride right onto the extensive network of trails, including ITS 82. . .. the gas pumps are handy, right across the street! Or, in summer, bring your boat or kayak and drive a few miles to the boat ramps at Umbagog Lake or Richardson Lakes; try and hook a huge lake trout or salmon. Motor or paddle up to the remote sandy beaches; see moose or bald eagles along the way. Fish for brook trout in one of the many crystal clear brooks and rivers. Drive a few miles north into the mountains to hunt partridge or deer. The Appalachian Trail is just a few miles down the road. Dramatic waterfalls and gorges, crystal clear cascades are all just a short drive away. And... closer, walk down the road to a secluded swimming hole with deep pools and waterfalls, on the Ellis River. Stroll across the street to the general store for a pizza or ice cream cone, or two doors down to the diner (with free WiFi) for a full hot breakfast, home made muffins, whoopee pies, or order a Prime Rib with a cold frosty on Saturday night. . . .. Or just "stay home" and relax in your large living room, admiring the beautiful tin ceiling, Van Gogh prints, or the Main St. sights beyond your huge picture window. Read a book from our library or play a board game in our collection. Play your MP3s on the stereo or CDs from our vintage collection. We have purposefully eliminated TV and internet from our tiny house, so that you will UNPLUG. . .. have more time to talk, play cards & read. In tiny homes, things are simple! Wifi is available at all of the village diners. Make lunch in the fully equipped open concept kitchen with breakfast bar. A large bathroom with full tub and a private bedroom in the rear with a queen size comfy bed complete your tiny house experience. A full size futon serves as extra sleeping for kids or guests. A door opens from the bedroom to the back porch and large yard for FIDO. WE ARE PET FRIENDLY! THE AREA: If you look at Andover on a map, you will see that it is located at the end of two state highways, Rt. 5 and Rt. 120. This tiny town is at the edge of the mountains, the edge of civilization. Here is where the pavement ends, and adventure begins! Kayaking nearby large remote lakes, you will see bald eagles, great blue herons, moose, deer, osprey, loons, mergansers, geese and more! There are rivers with riffles and rapids, too! 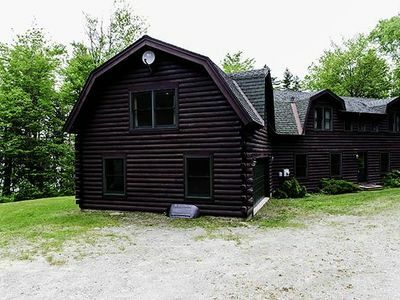 World class fly fishing, hunting, ATV trails galore, snowmobiling, snowshoeing, hiking.... you will not know where to begin! Andover is just a few miles from the Appalachian Trail, the height of land. Secret waterfalls and swimming holes, desolate dirt roads for biking and hiking.... mountain tops covered with blueberries, fiddleheads, raspberry fields as far as your eye can see! If you long for the simple life, free from TV and gadgets and glowing screens full of nonsense, you need to come to Andover, where life is quiet and simple. Sunday River Ski Resort is only a half hour away, Rangeley is about an hour's drive. Our Registered Maine Guide can point you in any direction you wish to go... even take you to her secret places! Ask about our guide service. Please go to our website below for more information, availability, reviews and to BOOK your vacation with us! 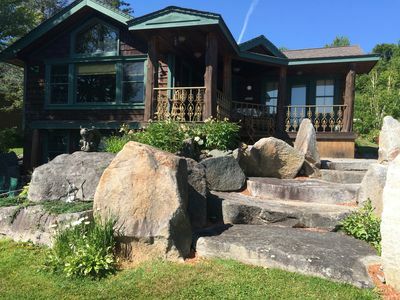 We have been operating the Skyline Ridge Vacation Rentals for over five years, and have collected over 100 five star reviews. See them on Airbnb and Trip Advisor where we have earned the Superhost designation 3 times in a row and a 2017 Trip Advisor Certificate of Excellence! 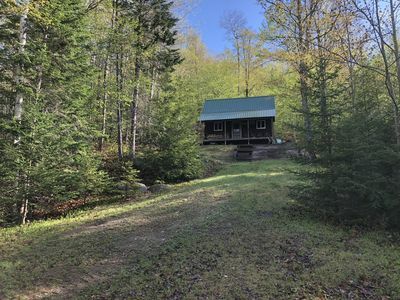 We have three rentals; a remote off-grid log cabin, a remote timber frame cabin, both with amazing mountain views, and this village tiny house with electricity and running water. (nearby mountain top overlook/picnic area included!) Check them ALL out! 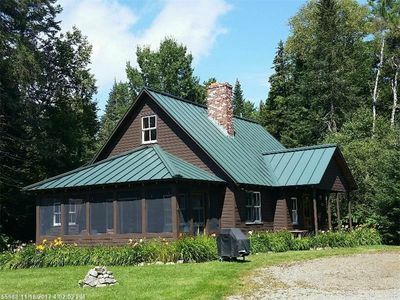 Historic country lodge in Maine's beautiful western mountains with private swimming pond and beach on property, close to lakes, streams and mountains. 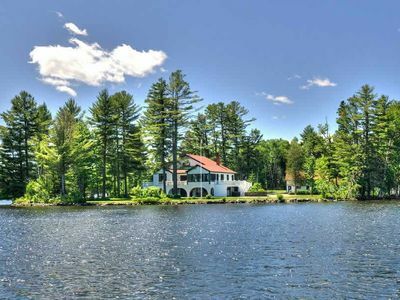 Nearby world-class fishing (Rapid River, Magalloway, Kennebago, Androscoggin & Swift Rivers, Rangeley & Richardson Lakes), golfing (Bethel Inn & Sunday River), and ski areas (Sunday River, Saddleback, Mt. Abram, Black Mountain). 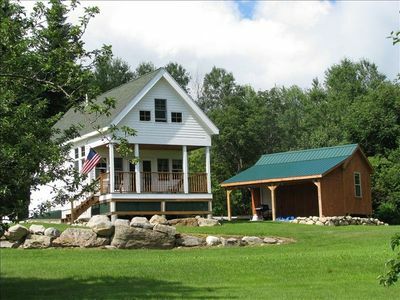 Magnificent setting with broad lawns and pastures overlooking mountain valley in the northern end of the Mahoosuc range. Pond & river on property. Trails on property and access to 4000 footers. 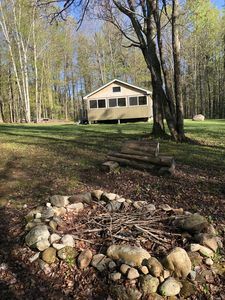 Plentiful outdoor activities: swim, boat, fish (stocked pond, great fishing throughout the area including some of the nation's most pristine wild trout waters), hike, bike, ride, berry pick, you name it. 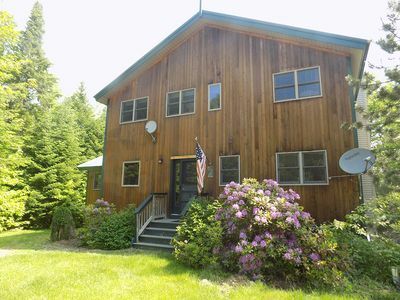 Nearby Bethel Recreation Area & Sunday River golf and ski resorts. 3 hours from Boston. 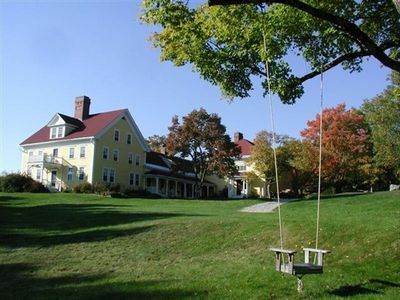 This is a truly unique vacation and recreation spot - comfortable and gorgeous with deep history in a friendly old-New England town. Built in 1792 by the first homesteading settler in the valley; renovated in the late 1800s at the peak of the railroad era into a private summer retreat with design contributions by Stanford White and Frederick Law Olmsted. Wonderful interiors including breathtaking Great Hall, several salons, Grand Dining Room. Long views that defy words. Rates quoted are for family vacation rentals with the indicated seasonal overnight guest maximums. Event and other rental rates quoted upon request. References required. Keywords: Sleeps 25+ in warm weather, 14+ in cold weather. Summer and winter rentals available. 2 kitchens, 2 dining rooms. Catering & event services available. 15 fireplaces. Contemporary utilities & amenities including wireless internet. Elegantly furnished. Weddings, reunions, special events, family vacations, corporate and group retreats. Destination Weddings. Ceremony and reception site. Trophy trout, salmon & bass fishing. Two golf courses nearby. Amazing for leaf peeping weekends. Downhill and XC Ski. Snow-mobile. Hunt. Hike the Appalachian Trail. Relax. 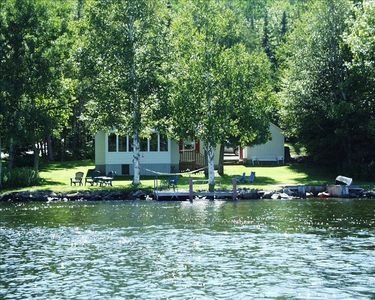 Rangeley Waterfront Cottage- Sleeps 5. Kitchen includes electric stove & refrigerator, microwave, coffee maker,linens, pots/pans & utensils, silverware, plates, bowls & glassware. Large living room including couch & comfy chairs. We offer a gas grill, picnic tables, fire-pit with Adirondack chairs & firewood. With a public boat launch close by, we offer two docks, one for your boat, kayak, etc., another for viewing sunsets and fishing. Swimming in clear crisp water with private cove, large grassy open lawn space, horseshoe pit, screened in porch. Don't forget your hammock as have hooks pre-set under the trees awaiting. Great location for kids as tapered water level, grassy area to play that game or throw a Frisbee. Plenty of sun when the weather is right. 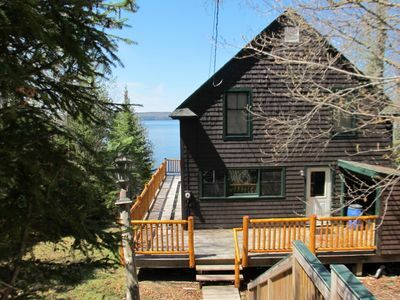 Charming 4 bedroom cottage offers spectacular views of the Lake! The Sunday River Retreat overlooks 7 of Sunday River's 8 ski-able peaks. From the 8 person hot tub, watch the groomers get the slopes ready for another great day of riding. This enormous fully furnished 6 bedroom, 2 1/2 bath house is more than just a home away from home with 24 foot cathedral ceilings, hard wood floors, large dining room, a full kitchen, 8 person hot tub, satellite TV, pool table, foosball, ping-pong and much more. 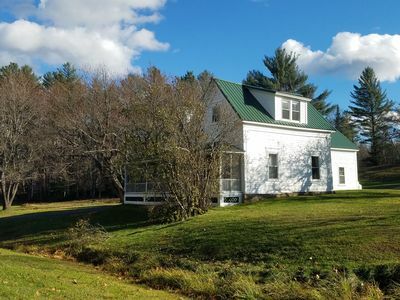 Located off the beaten path, it is still just a 5 minute drive to the Sunday River Ski Resort and 10 minutes from the historic Bethel village. 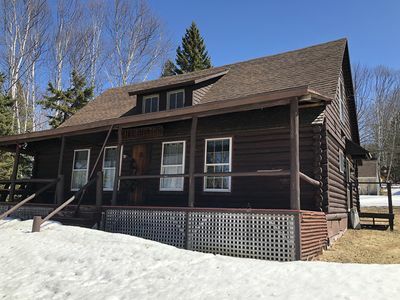 On the main floor are 2 bedrooms, each with a full-sized bed and dresser and one with a set of bunk beds, a half bath, a living room with 24 foot cathedral ceilings and hard wood flooring, an over-sized kitchen and dining room. The kitchen is fully equipped for many guests and includes a stove, microwave, dishwasher, coffee pot and many other cooking accessories. Unwind while watching satellite TV or your favorite movie on the DVD player. Two sliding glass doors open to a huge deck where you will find a relaxing 8-person hot tub. On the upper level you will find 4 bedrooms, each with a full-sized bed and dresser and 2 full baths. On the lower level you will find a game room and washer & dryer. This game room has lots to do with a ping pong table, pool table, foosball, satellite TV, VCR, DVD, video games, board games and books. We provide clean sheets and bedding for all beds. The Sunday River Mountain House is perched hillside on the Sunday River Road in Newry, Maine. 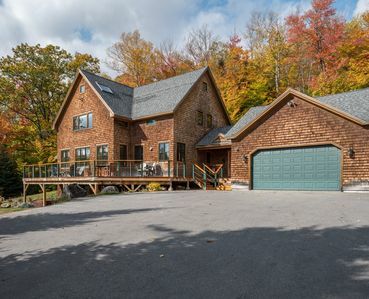 This beautiful custom home offers a private setting for your Sunday River getaway. Turn your ski vacation into a true retreat by enjoying the fresh mountain air, starry nights, restful sleep and relaxing soaks in the outdoor hot tub. The location puts you 6 miles from the heart of Sunday River Ski Resort. Here you will find unlimited world-class alpine skiing, Nordic ski centers, restaurants, cafes, bars, shops and close access to snowshoeing, hiking or snowmobiling on the ITS trail network. The high-end home offers you plenty of space and a sleeping capacity of 16 people. Park your cars in the two car garage and unload right into the large mudroom with racks for both skis and snowboards and plenty of space for outerwear storage. The ability to dry boots, hats, and gloves overnight will be appreciated in the morning. The large kitchen is open, bright and fully equipped with all the necessary appliances to cook meals together, should you choose to forego the tempting area restaurants. Stainless steel appliances, gas range, two ovens, and wet bar will make this an easy choice to stay in for a night or two. The living room is spacious and open to the kitchen so that the group can visit around the large wood burning fireplace while the chef is at work! The dining room table comfortably seats ten with additional seating at the kitchen island. If the weather allows, the large three-season sunroom is a great place to enjoy hot cocoa and take in the peaceful Maine woods experience. After dinner, retreat to the lower living level for an evening soak. Those that choose not to utilize the hot tub will be entertained with a game of pool or foosball. The large, flat screen TVs throughout the house allow you to keep up on the weather, sports, and news no matter where you are in the home. Board games, card games, and puzzles for all ages entertain on days away from the slopes. Each bedroom is spacious with closet storage. With a bathroom on each level, the floor plan offers private or suite-style living arrangements. There is a fourth-floor loft which is open, spacious and bright. This space has been used in the past for a yoga room, a meditation room and as an ideal place for young imaginations to run wild and play fortress games. There is a washer and dryer on site as well as all necessary towels, linens, and cleaning supplies. Should you wish to schedule a cleaning service during your stay at the Sunday River Mountain House, that is certainly an option and we will help arrange this for a time that you will be out on the slopes. 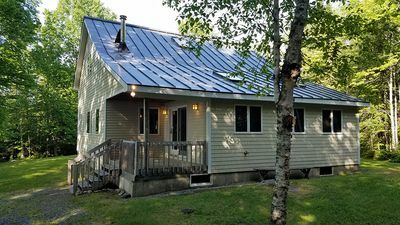 A backup generator allows for electricity at this home should the power go out, which is rare but possible in rural Maine. 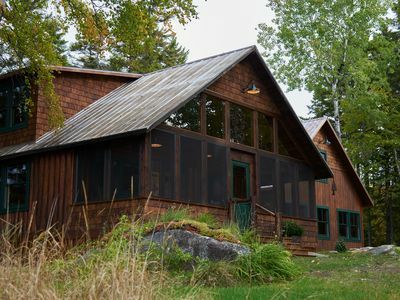 This home is well insulated with radiant heat and is designed to be hassle and worry free! 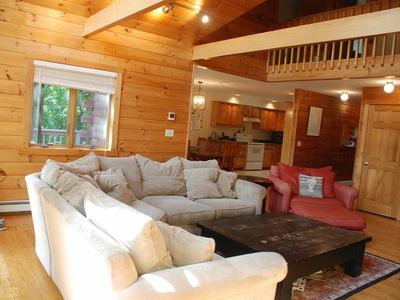 Book the Sunday River Mountain House today!